Did they get it? The ladies of the mountain try to catch a toad. Toads have a propensity of urinating on you when handled. 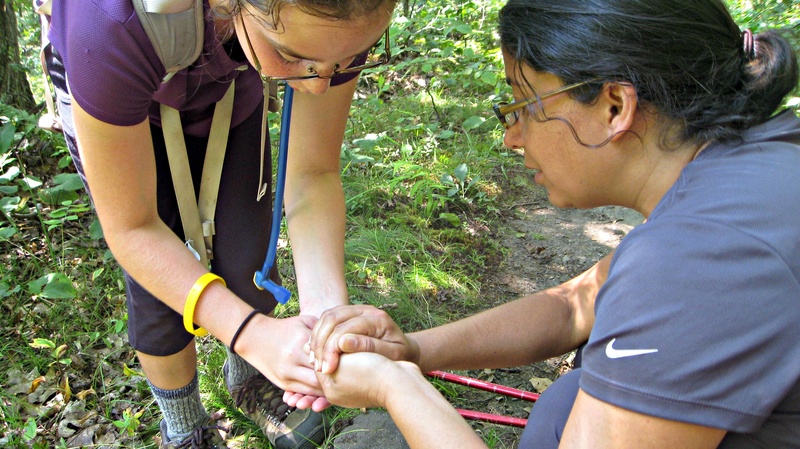 This much becomes clear time after time as Meenakshi teaches Janelle how to be a catcher of toads. It’s not as easy as you’d think. Those little guys can be fast. Plus, you have to ignore the clear, oily liquid that ends up in your hand. And contrary to mythological belief, you cannot get warts from toads. Though there is a toxin located just behind the toad’s eyes that can irritate your mouth and make you nauseous if you try to eat one. Don’t try to eat one. Our hike up obscure Mt. Roberts is all about toads. They are everywhere; tiny little creatures bounding this way and that over the trail, rustling leaves and, yes, peeing on our hands. Perhaps Mt. Roberts’ deep oak forest offers toads cover from predatory birds. Perhaps the surrounding area’s wetlands breed plentiful mosquito bounty for toads to eat. Either way, there are so many, we begin to count. 10. 18. 24. 35. 40. 50. Then, just as we are about to leave the trail at the end of the day we see one final toad. 52. We all laugh. It’s a sign of course. The Toad Gods have honored our adventure by providing us the exact number of toads as mountains in our quest. Perfect. Delightful. Despite the pee. Location: Lakes Region, I-93 to exit 23 to Route 104 east to Route 3 north to Route 25 north through Moultonborough to Route 109 south to Route 171 south to Ossipee Park Road to Castle in the Clouds. Our trailhead: Mt. Roberts Trail (located north of the salmon pond, past the barn) up and back. Distance: 5 miles round trip. “Hey, what’s for lunch?” Janelle and I turn from our summit perch and watch as a big, middle-aged hiker with a scruffy pack and both knees wrapped hauls himself up near our rock. The summit of Mt. Webster is on the AT and he looks like a thru-hiker. We don’t mind at all. In fact, we’ve begun to look forward to the company of other hikers, especially upbeat and cheerful ones like this fellow. His trail name is Rain Man, and it turns out he’s section hiking. He’d been on the trail through New Hampshire for a week and is going to cap off this part of his AT hike by finishing atop Mt. Washington. We sit and chat amicably. Well, he does most of the talking, actually. He’s from Tennessee. He tells us about his AT journey so far, and talks proudly about his daughter, who thru-hiked the trail in one shot a couple years ago. “Guess you could say I’m following in her foot-steps, just more slowly,” he says, and laughs. Janelle sits quietly through most of this, but now speaks up. 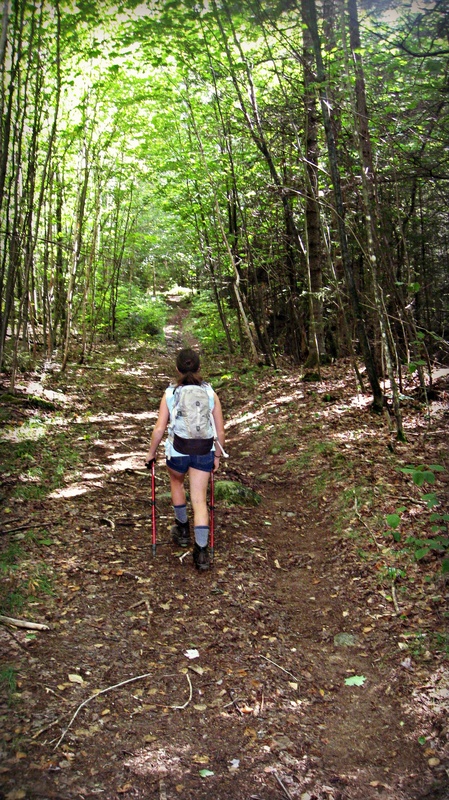 “What’s a thru-hiker,” she asks. Location: Crawford Notch, I-93 to exit 35 to Route 3 north to Route 302 to Highland Center. Our trailhead: Webster-Jackson Trail (Webster Branch) up and back. Tailhead is located just north of Elephant Head on west side of 302 near Crawford Depot. Two weeks ago, we had attempted to hike Cherry Mountain up to its Mt. Martha summit. We didn’t make it. I had pushed Janelle too far, too many hikes in a row, too much pressure perhaps. A half mile up the mellow trail, she turned to me with tears in her eyes and asked if we could go home. She couldn’t answer. She shook her head. She looked miserable. We turned around. On the way down she said she felt bad for disappointing me. “For what?” I asked honestly perplexed. So now we had returned. The day is hot. Her feet are beat up. She had just hiked the longest hike of her life the day before. And as we turn to face down the mountain that had turned us back once, I wonder how she’d handle the hike this time. I stop her at the trailhead, and once again crouch to her eye level. Location: Twin Mountain, I-93 to exit 35 to Route 3 north to Route 115 north. Our trailhead: Cherry Mountain Trail (located directly across from Lennon Road) up and back. B & TC at the summit of Mt. Willard. Our friend Steve has joined us for our hike up Mt. Willard and Janelle is leading him into the forest. We’re at the summit, the second of the day. It was slow going getting up here, but with food in her belly and the spectacular view of Crawford Notch, Janelle is back to her old self. 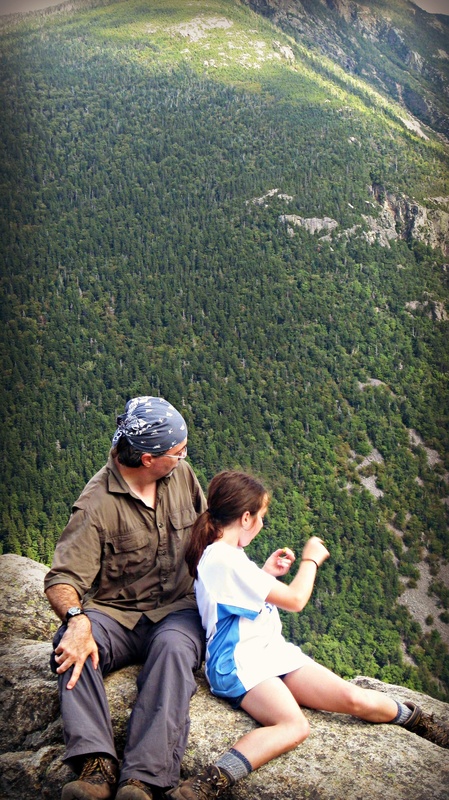 Beat paths lead to various lookouts along Willard’s cliff-like summit edge, and the girl is set on exploring every one of them it seems. She’s taken to Steve and I let the two of them get ahead of me. She’s moving fast, with authority, and I’m struck by how solid her footing is becoming. She’s developing trail legs, something she’ll need in the weeks ahead as we set our sights on much longer and harder trails. “Look, look!” she’s shouting from somewhere ahead. I come around a turn expecting the two of them to be enjoying a grand view. There is a grand view, of course, but Janelle doesn’t see it. Instead, she’s crouched down, engaged in a staring contest with a deep green grasshopper. She looks up at us and grins, and what can one do after a smile like that? Steve and I share a knowing look and sit down to watch the girl and the insect, the views forgotten. Location: Crawford Notch, I-93 to exit 35 to Route 3 north to Route 302 east to Highland Center. 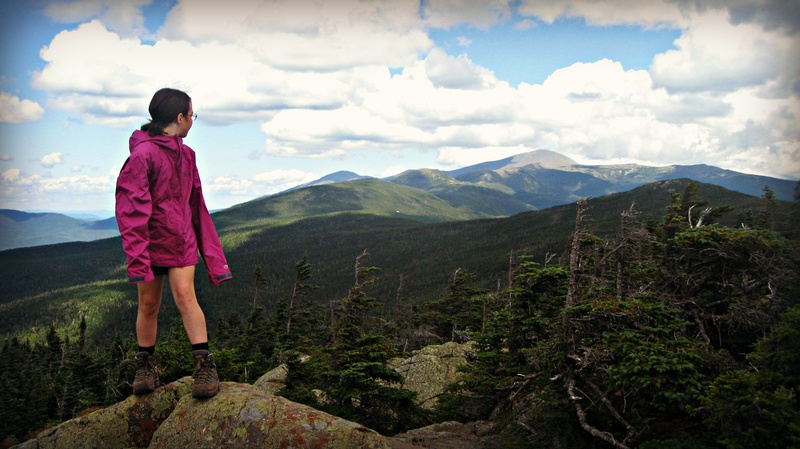 Our trailhead: Avalon Trail to Mt. Willard Tail (located behind Crawford Depot) up and back. Summit number one that day. Behind Tough Cookie, our goal in two days, Mt. Webster, awaits. Mt. Avalon juts sharply into Crawford Notch, a mountain between two mountains, nestled uncomfortably between Mt. Willard’s valley overlook and Mt. Field’s majestic height. 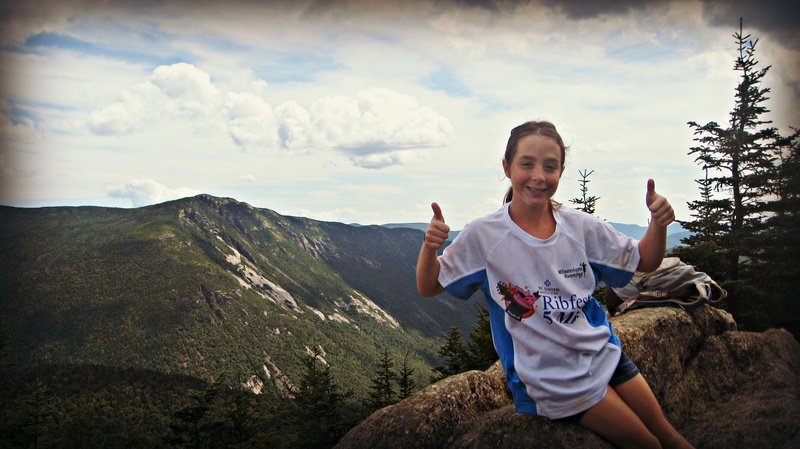 Our mountain is only 3,442 feet, but Avalon makes demands on a hiker. If we make it, Avalon’s summit will be the highest Janelle has ever been, but she’ll have to climb a relentlessly steep half mile to get there. And there’s one more thing different about today. On this bright, clear, hot morning, my plan is to push Janelle further than she’s ever been. Once we finish with Mt. Avalon, instead of returning to the comfort of the Highland Center, we’ll turn left off our trail and push back up to Mt. Willard. Two in one day. Six and a half miles. It’s the second day in a four-day run for us, and I don’t know how she’ll handle both the extra miles, as well as the marathon hiking. So, as we sit in the parking lot, I take a little extra time taping her feet. Strangely, this little necessity has become something of a soothing ritual for us. She can do this herself of course, but we like it this way. She enjoys the attention, and the extra ten minutes gives me a chance to gauge where her head is before we start. But if she has any doubts about the big day ahead, she doesn’t let them show. And soon, she’s bounding up the trail ahead of me, my spider monkey, leaping up the steep rocks like she’s been doing this all her life. All I can do is follow. Our trailhead: Avalon Trail (located behind Crawford Depot) up and back.